As an oceanographer who gets chronically seasick I have spent most of my career finding research opportunities and excuses that help me avoid going to sea. For past 3 years, however, I have willingly ventured out in the middle of summer on the R/V Oceanus from Newport to deploy ocean bottom seismometers for the Cascadia Initiative, an ambitious 4-year community experiment funded by the National Science Foundation to blanket the Cascadia subduction zone and Juan de Fuca plate with autonomous seismic recorders. So why have I gone to sea? First, from the pragmatic point of view it pays my salary which in a time of diminishing science budgets (in dollars adjusted for science inflation) in NSF’s Division of Ocean Sciences is nothing to be sneezed at. Secondly, I have discovered that as I grow old I no longer get quite as seasick particularly if I only venture into open waters in July/August. Third the Cascadia Initiative is a really neat experiment that represents a new way of doing business and a science model that might just set marine seismology out of the doldrums. The Cascadia Initiative Experiment (Cascadia Array) and other geophysical observing systems in the Pacific Northwest (Created by the Center for Environmental Visualization). Traditionally the Marine Geology and Geophysics (MG&G) Program has used NSF’s vaunted peer review system to fund small groups of scientists or even individual scientists to do seismic experiments at sea. Seagoing work is expensive and so as the purchasing power of MG&G’s budget has declined fewer and fewer experiments have been funded. As the number of experiments declines, the facilities that support seismic experiments, namely the R/V Marcus Langseth seismic vessel and the Ocean Bottom Seismography Instrument Pool, are no longer fully utilized. They become more expensive per experiment, further adding to the strain on budgets. More worrisomely is the effect of declining budgets on the health of the community and particularly the availability of funding for young scientists. It is difficult to get an expensive experiment funded with no track record and so the “play it safe” outcome in an era of declining funds is to fund established scientists and allow attrition (from retirements and scientists going in new directions) to shrink the existing community. This is unhealthy. 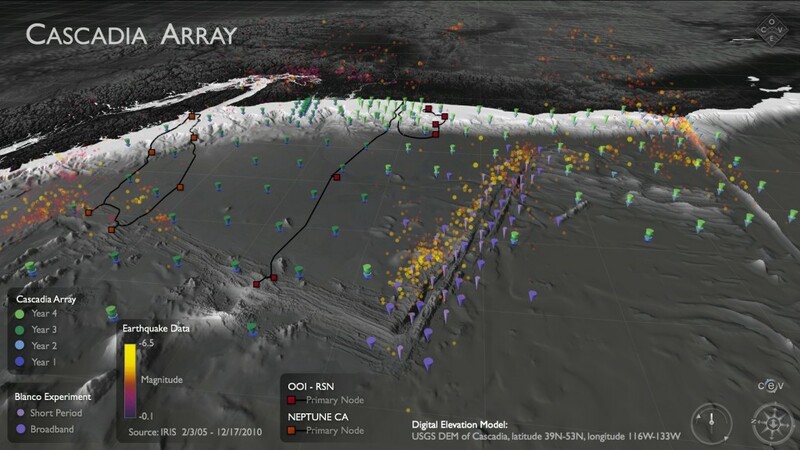 The Cascadia Initiative is a new approach to marine seismology experiments that follows the very successful example of the Earthscope program on land. Taking advantage of the availability of Stimulus funding, $10M was secured to acquire new instruments to form the Amphibious Array Facility (AAF) a collection of land seismometers and GPS stations and ocean bottom seismometers. The first experiment with this facility focused on Cascadia. Unlike PI driven experiments, the experiment design was the consensus outcome of a community meeting. A group of scientists led by Doug Toomey at the University of Oregon and including me was tasked to acquire but not analyze the data and to entrain young scientists in the seagoing work. The data from the experiment is put immediately into the public domain and and NSF encourages scientists to write relatively cheap proposals to analyze it. The experiment still has a year to go but it has already created a large user community many of whom have never worked with marine seismic data before. The experiment data can address a wide variety of questions related to the deformation and hazards of the Cascadia subduction zone and the dynamics of the Juan de Fuca plate but is has other unanticipated uses. I am interested in looking at earthquakes near the Juan de Fuca and Gorda ridges but so far my research with the data has been work funded by the Office of Naval Research to study blue and fin whales both of which call within the seismic frequency band (see my Whale Seismology page). The shear scale of the Cascadia Initiative experiment provides a unique opportunity to study the seasonal distribution of calling whales in the northeast Pacific and understand how these are related to migration patterns and to environmental parameters that can be linked to food sources. It can also help the Navy understand and minimize the impact of their operations on these endangered species. NSF is now contemplating what to do with the Amphibious Array Facility after the Cascadia Initiative experiment ends. Some scientists want to take it to Alaska (great for whale studies), others to the East Coast (not quite as great but still interesting) and a few may argue to keep it in Cascadia. The offshore component of the AAF is expensive to operate and it is not clear if MG&G can afford it on their current budget. There may be pressure to scale back its operation so that community experiments use fewer instruments for less long, or even to abandon the facility to traditional PI experiments. However, if the new community of marine seismic data users who have been entrained by the Cascadia Inititive is set adrift without new community data sets to excite them, then it may be harder to make a strong case for increased funding for marine seismology. This is the conundrum will hopefully take center stage at Future of the Amphibious Array Facility workshop that will be held in Snowbird later this month – pity we could not wait a couple of months so that we could all ski!